If you're familiar with K-beauty then you know it's on the leading edge of skincare. There's always something new to try from Korean skin care brands, and lots of them are really fun to boot. 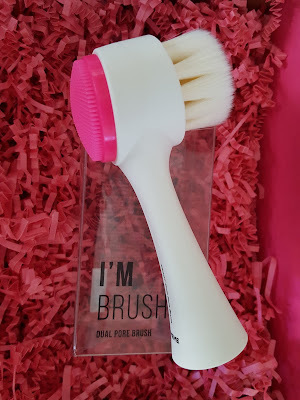 Memebox's very own I'm Series line of makeup and tools has rapidly expanded over the past year and I got the chance to try try out their new I'm Dual Pore Brush over the past couple of weeks. 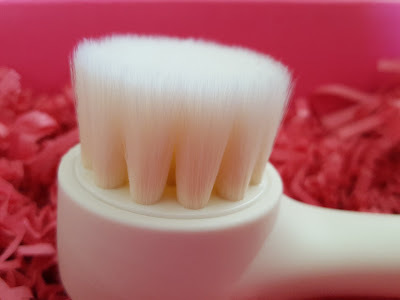 Instead of using your fingers to massage in your cleanser, use this brush to reach deep into pores. 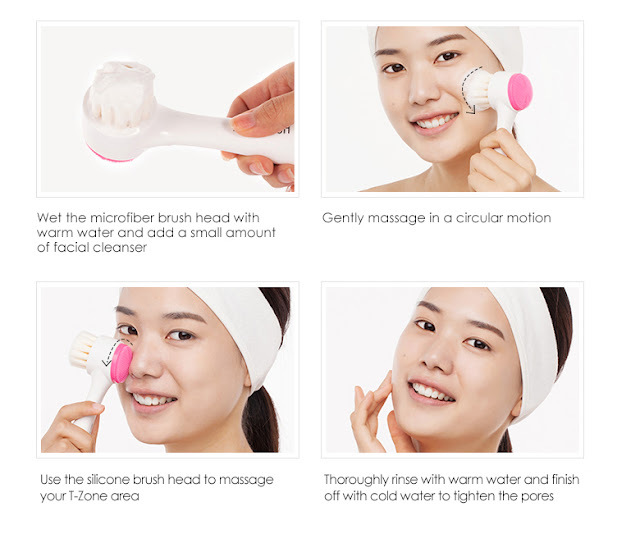 The brush head is double-sided; one side contains 550,000 microfiber bristles to deeply clean pores without irritating skin, and the other side features silicone bristles to massage skin and remove blackheads while also restoring good circulation to the area. So I got the brush, but what about a cleanser? 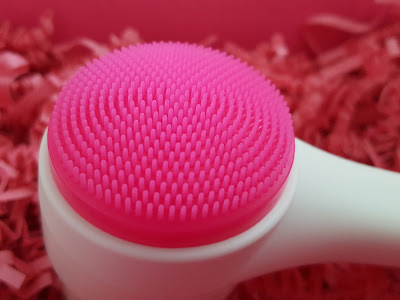 Memebox recommends using the dual pore brush with a foam cleanser, which I did -- but first! I want to do a quick plug about two step cleansing. Step One is to use an oil or cream cleanser and Step Two is to follow up with a foaming cleanser. I was always hesitant to use oil cleansers because my face is on the oily side. Then I remembered high school chemistry and the rule that "like dissolves like." So basically that means an oil-based cleanser should dissolve sebum and other oily impurities (ever wonder why oil-based makeup removers work so well?). And a water-based foaming cleanser should remove water-based impurities like dead skin and sweat. 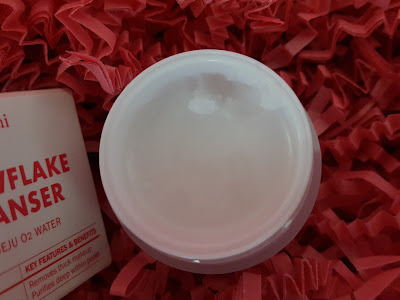 So I tried it and sure enough, after a few weeks of using two step cleansing, I hadn't had a single breakout which is pretty rare for me. 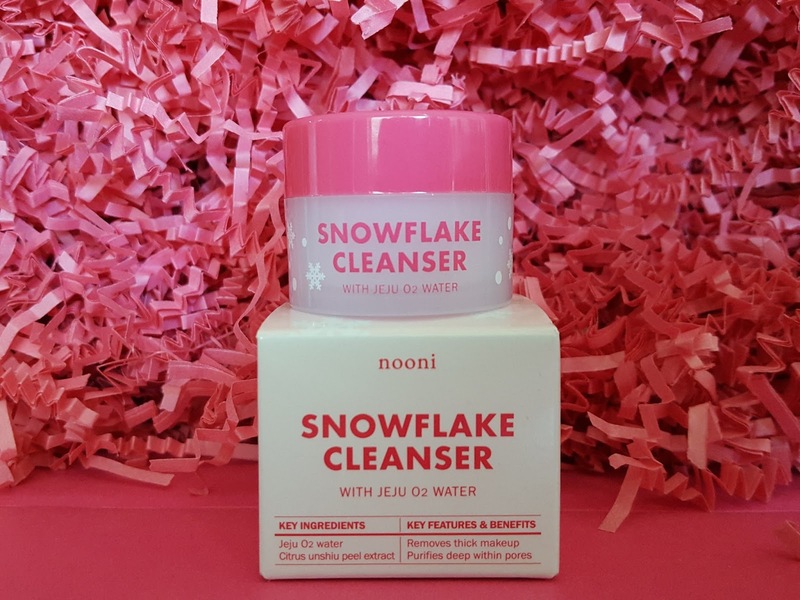 For the purposes of this review I started with Nooni Snowflake Cleanser as Step One. This is an oil-based cleanser formulated with Jeju water to promote elasticity and shea butter to moisturize your skin. Under normal circumstances oil and water don't mix so you'd see a definite layer between the two, but this cleanser is anything but normal when it comes to consistency. Why? It's a balm, oil, and milk all in one. I'm not sure how, but it's definitely pretty cool. Remember how I mentioned earlier that lots of Korean skincare products are fun? This is one of those. The cleanser is a solid in the container (sorry for the terrible photo quality), kind of like sherbet. Put it on your skin and it melts into an oil to remove residual makeup and sebum. Massage it in a little more and it turns into a milky consistency to lift away water-based impurities. More detailed instructions in the screenshot below. Not as pretty as Memebox's pictures, but it really does melt in three phases! The brush is unbelievably soft and admittedly I found it a bit weird and creepy how much I wanted to just massage my face forever with it. The silicone side is also oddly satisfying. After all this you end up with a super clean face and a huge smile. The only downside to the brush (or any microfiber brush) is that the bristles take soooooo long to dry. You definitely want it to dry between uses to prevent mold so you probably shouldn't leave it in your steamy bathroom. I tried leaving it by a window but it still wasn't completely dry the next day. It actually took two days. Perhaps blow drying it will help? But I'd imagine that'd get a bit annoying after a few days. I guess you could always buy a few brushes and cycle through them but that's expensive. Does anyone have any suggestions? 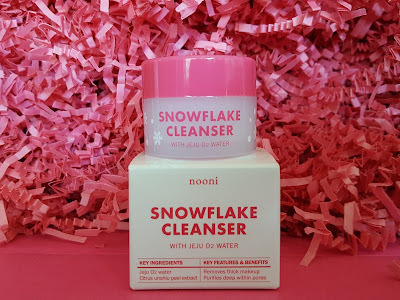 Note: I received I'm Dual Pore Brush and Nooni Snowflake Cleanser from Memebox for review purposes. I did not pay for these items, but I can assure you these are my honest opinions :) This post does not contain any referral links.